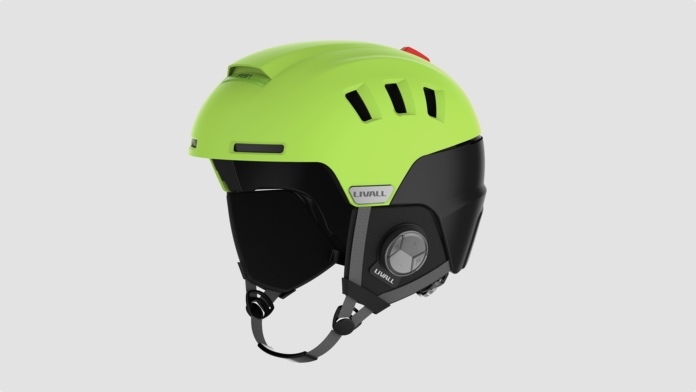 Cycling sensor company LIVALL has launched a series of smart, connected helmets for cyclists and skiers. There's some pretty crazy brand terminology coming up, so bear with us – because there are some neat features baked in. The MT1 cycling helmet features a Bluetooth connection for answering calls hands free, and pairs to a handle-bar mounted remote control called the Bling Jet. There's a strip of LEDs on the rear of the helmet (the Bling Strip) that automatically illuminate when the built-in light sensor detects it's too dark, and users can signal left or right using the Bling Jet, which is a neat extra safety feature. There are smart features, too. The companion LIVALL Riding App will detect speed, distance and standard ride metrics, and will pair up with the company's specialist sensors for cadence and heart rate, recording all your ride data in one place. The RS1 ski helmet is a little less smart – but has a built-in speaker and microphone, which enables users to take calls and listen to music while on the slopes. The CEO of LIVALL, Brain Zheng, said he was inspired to create smart cycling helmets after a fall from a bike landed him in hospital a few years ago. He said: "As I hear more and more about skiers suffering horrific injuries on the slopes, and as a keen skier myself, it seemed like a natural step for LIVALL to enter the smart ski technology market to help ensure safety on the slopes." We had a quick try of the helmets at the company's stand at IFA 2017 in Berlin, and found them to be really light – with the added technology contributing little to the overall weight. The MT1 is available on Amazon for $179 and the price of the RS1 is yet to be confirmed.